Ha. Was gonna post this in the bulletin board post but I think it’s cute enough to stand on its own. 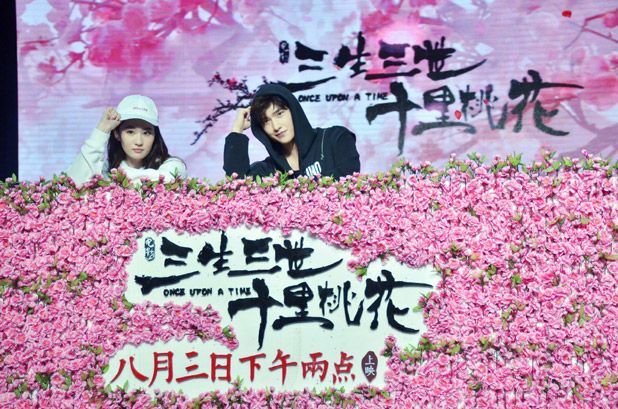 The leading pair of Once Upon A Time, Yang Yang and Liu Yi Fei, have been promoting their movie together in various cities and on the night at Shanghai, they performed a hip-hop dance routine onstage. I have to be honest and say my eyes were glued on Liu Yi Fei the whole time until the last few seconds when Yang Yang did his backwards solo scoot. Lol. While both have dancing background, I think Yang Yang has more precision and energy, still I kept going back to our pretty Fairy, in awe with her from beginning to end, especially those chest popping! After 4 days, Once Upon a Time has grossed cumulatively CN¥423 millions in China (Wolf Warriors 2 continues to dominate with a total of 3.1 Billion in 11 days, crazy crazy). Comparing the two movies is like comparing apples to oranges, different genre, different audience target. To find out where in the US the film is showing on August 11th, Brenda has dropped a useful link here: http://www.wellgousa.com/theatrical/once-upon-a-time. This entry was posted in Entertainment News and tagged CMovie, Crystal Liu Yi Fei, Once Upon A Time (三生三世十里桃花), Wolf Warriors 2 (战狼2), Yang Yang by Kappy. Bookmark the permalink. Awww Lookie. 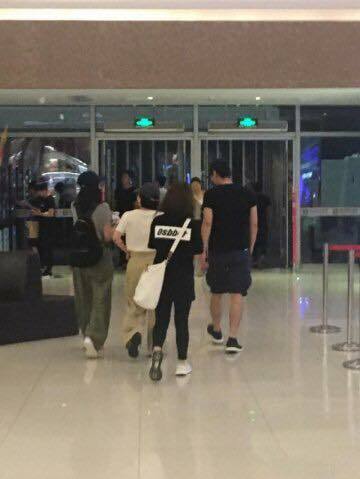 Mark Zhao (the drama Ye Hua) took his wife Gao Yuan Yuan on a movie date….to see Once Upon A Time. =) What a gentleman and a good sport! Yehua going to see Yehua. I wonder if he asked his wife which Yehua fitted the term of the most beautiful man in all the lands? Though from memory it was the older brother fox that had a gay storyline with the older fox that was most beautiful and not Yehua. Yang Yang is actually.. not that precise. He kept flailing his arms about. Liu Yifei did it better. I saw this movie is getting so many terrible reviews. Both lead actors cannot act. They should have never made a movie for this. I think the biggest review point was the compacted storyline not the acting. I am waiting to watch this movie to see if it really is that bad 🙁 The reviews aren’t great but I really want to watch it and judge it for myself. Hopefully it isnt that bad. Movie aside damn they look so cool here. YY’s expression says it all hahaha! I wish we could have seen LYF’s face though! The movie is not as interesting as the drama. It’s getting boring half-way looking at YY and LYF, because they don’t have that character’s expression and feeling shown out. Simply put, they don’t know how to act. The drama is way better! couldn’t agree with you more. The movie itself is fast paced not like the drama where it goes more in details like the novel. Overall, I didn’t like the movie version. Mark still slay as ye hua in my opinion. Thanks for the us movie locations link – it’s playing in my town! I’m not thinking it will be great but a fun afternoon out. LYF mum was a dancer so she learnt dancing at a young age but never pursued it. She’s not trained like YY but just continued to dance as a hobby. So you can’t really say she has a dance background. From memory she went to acting school not a dancing one. They were both good but YY’s lines were more defined and he finished his moves as oppose to LYF who tends to not fully extend herself. I like it that they use urban pop culture to promote a movie in an ancient setting :D. From the extended video, it looks like Yang Yang did the choreography? Kappy can we have a review thread for the movie? I plan on seeing it this weekend in theaters with my bf and I know a bunch of people here are too.